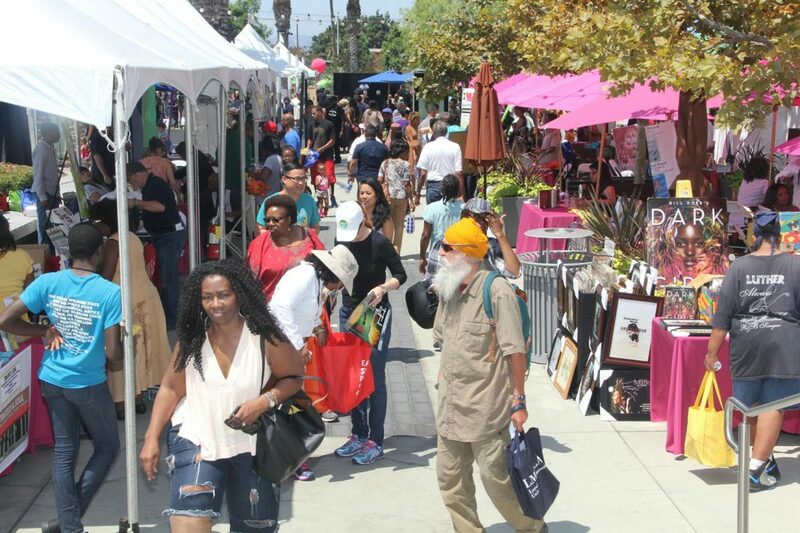 Each year, the Leimert Park Village Book Fair has a theme; at this year’s event on Saturday, August 25, that theme is “Tribute to our Southern Roots,” with a special focus on the Great Migration. “We really wanted to highlight that in our event this year with displays, exhibits, and guest speakers,” says Cynthia Exum, founder and executive director of the fair, now in its 12th year. Exum has a personal connection to the chosen theme. Her grandmother traveled to California from Memphis, Tennessee, in the 1930s with her 11 kids. “I would hear stories about how they traveled on Route 66 and some of the problems they encountered on the road,” she says. This year’s distinguished lecturer, New York Times bestselling author Eric Jerome Dickey, also has Southern roots. Originally from Memphis, Dickey moved to Los Angeles to pursue a career in engineering before becoming a writer. He specializes in urban fiction—his latest bestseller, Bad Men and Wicked Women, came out in April—and has also written a six-issue miniseries of Marvel comic books featuring X-Men’s Storm and Black Panther. He’ll appear on the festival’s main stage at 1 p.m.
Saturday’s schedule also includes a walking tour that mimics the Great Migration, a presentation of vintage photos of migrants, and opportunities for visitors to research their own Southern heritage. Exum grew up on Southern cooking, and when planning this year’s fair, she said to herself, “If we’re gonna do Southern, we’ve just gotta go all the way Southern.” On the main stage at 3 p.m., Greg Dulan of Dulan’s on Crenshaw and Jeanette Bolden of 27th Street Bakery will discuss the Southern cuisine of yesterday and today. At 4 p.m., pie makers including 27th Street Bakery, Gwen’s Specialty Cakes, Shae’s Cobblermania, and the Pie Hole will be offering free samples of some of the best Southern pies available in Los Angeles. Exum and fellow organizers worked together with the Los Angeles Public Library and the County of Los Angeles Public Library to compile a list of must-read books based on this year’s theme. The list, which includes fiction and nonfiction books by Southern writers and based on Southern themes, will be unveiled at the fair. The Leimert Park Village Book Fair is Saturday, August 25, 10 a.m.-5 p.m., at Baldwin Hills Crenshaw Plaza, 3650 W. Martin Luther King Jr. Blvd, Leimert Park. Admission is free.